Located in the province of Catania, in the Italian island of Sicily, is the town of Grammichele. It is one of the few towns in the world to have the unique hexagonal layout. The town was founded after the great Sicily earthquake of 1693 wiped out an earlier settlement called Occhialà, located to the north of modern Grammichele. The survivors built a new town and named it Grammichele, after St. Michele, in the hope that the saint will protect the new town from further disasters. Grammichele was built by Carlo Maria Carafa Branciforte, the Prince of Roccella and Butera. Designed by Michele da Ferla, it was the first city in Europe with a hexagonal plan. Its layout was probably inspired by Palmanova, a fortified town built one hundred years earlier. The main difference is that Palmanova is based on a nine facets polygon, while Grammichele has a hexagonal plan that could be potentially extended indefinitely. The hexagonal plan designed for Grammichele is divided into six sectors by six roads all converging towards the main square, that is hexagonal too, on which public offices overlooked. Many collecting areas were created in the town for residents to gather in case a calamity struck. These squares were equidistant and all connected by a geometrically concentric road network around the main hexagonal square, now called Prince Carafa Square. Beyond the hexagon, four rectangular districts were designed. One of them was supposed to contain the Prince Palace but it was never built. Hexagonal planning is rare today, “a mere oddity among a vast array of ideologies, theories and methods,” writes authors Eran Ben-Joseph and David Gordon on a paper on hexagonal planning. It briefly caught the attention of various planners, engineers and architects in the early 20th century, but none were able to build large scale plans of this layout. The New York architect and art historian Charles Lamb advocated the hexagonal city plan as a practical and artistic solution to the ills of the modern city. He claimed that such a system would not only allow for the creation of beautiful European-style boulevards but also allow for planned growth and healthy living. The Australian engineer, Rudolf Mueller, pointed out that the hexagonal layout would lead to potential savings in the length of the water lines as well as those for the sewer system. Fewer hydrants and water mains could serve a larger number of buildings, and shorter service lines could be laid between the mains and the buildings. Others such as Arthur Comey envisioned entire regions covered with small hexagonal towns, connected to each other and to large ones, and larger towns connected to major metropolitan areas, creating a carpet of hexagonal cells. The turmoil of World War 2, however, put an end to hexagonal planning. In practice, hexagonal blocks would have been too unusual to be a workable solution. 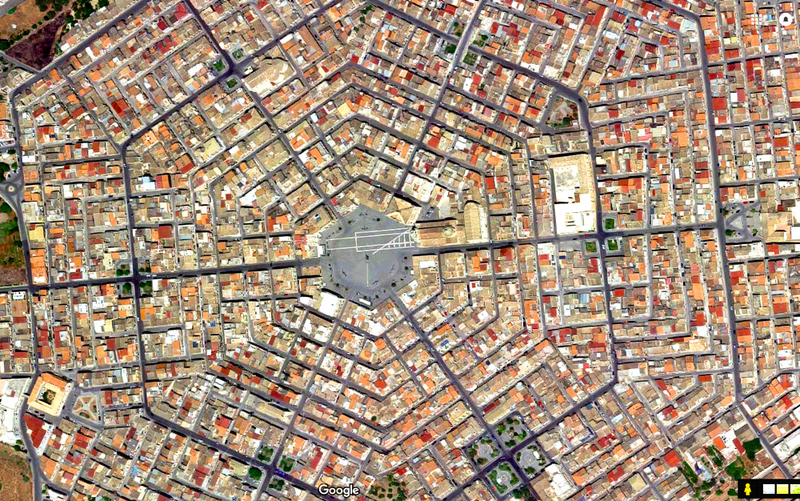 “How would streets be named or dwellings numbered in a hexagon plan? How would strangers navigate the streets of Hexagonopolis?” asked Eran Ben-Joseph. Besides, residential developers and home buyers did not like triangular lots and awkward corners. “Hexagonal planning is a concept that may work in theory but not in practice”, he concludes.